30% of games that received 10,000 or more gameplays were considered highly rated (3.75 or higher). One of highest percentages of all time! But, I want to highlight a couple of numbers that I feel hammer home our continued dedication to foster the growth & success of the web game community. One of most popular features on Kongregate.com are game badges. If you’re unfamiliar with badges, think of them as an achievement system. Kongregate typically adds 2-4 badges to highly rated games. Our players collect these badges for their profiles and bragging rights. We love issuing these badges, as we get to promote critically acclaimed games to the community and provide much-warranted recognition to developers. 2017 was the first year since 2011 where we issued more badges than the previous year. Kongregate made a concerted effort to reach out to developers so we didn’t miss badging worthwhile games. We even found the time to add badges to older games that we overlooked! Part of Kongregate’s mission statement is to support developers and their games. Without game developers sharing their art and passion with our community, Kongregate would be an empty place. One way we help out developers is with our monthly developer contest: games uploaded any time during a calendar month are eligible. The top-rated games that implement our statistics API win a cash prize! Notably, we expanded the monthly contest prize pool in April of 2017. There is an extra $1000 in prizes per month, and we’re now recognizing 15 games. Simply put, that means more prize money to more developers! Since April 2017, 103 game developers have placed in the top 15 and claimed a cash prize. While winning a cash prize is a boon for developers, Kongregate also wants to make sure that everyone gets a chance to play these great games. We now create Feature Rolls that appear on the front page to promote the winners, include the winners list in our weekly newsletter, and tag the developers in tweets from our @Kongregate account. The ultimate goal for us is to provide developers, new and old, an audience for their projects and connect them to players who find them fun! Even as Kongregate expands into the world of mobile, PC and console gaming, web gaming still remains a core part of our identity. We continue to make improvements and investments into Kongregate.com to ensure we provide our players the best experience, especially as older technologies and best practices are being phased out. Our engineers had a hell of a time in 2017, working hard to move our APIs off of Flash as major browsers announced that they are ceasing Flash support in 2020. Since our engineers were sprucing the place up, they also moved Kongregate to SSL, ensuring that the entire site is fully secured for our players. Unity Web Player, one of the more popular game engines that allowed thousands of game developers to cut their teeth on the gaming scene, lost major browser support in March. Even with looming sunsets of older gaming technology, the web development scene is still healthy and growing! Unity switched their focus from the Web Player plugin to supporting HTML5 with their WebGL tech. This plugin-less technology has opened up gaming to be safer, faster, and even cross-platform with mobile devices. Speaking of mobile, we’re seeing some great successes with mobile-published titles coming to web. Our published games, such as Animation Throwdown and Spellstone, cultivated vibrant player communities when they published their web versions on Kongregate.com. Those games, alongside Bit Heroes, led the way for our virtual goods games, as we substantially increased our web revenue for Kongregate.com in 2017. Games like Bit Heroes and Realm Grinder started out as web-only games on Kongregate.com (and so did AdVenture Capitalist, but I’m sure you all knew that already). That’s not surprising, as our website continues to be a fantastic proving ground for potential mobile hits! And those nostalgic for Flash gaming got a great surprise when Super Fancy Pants made its triumphant return. 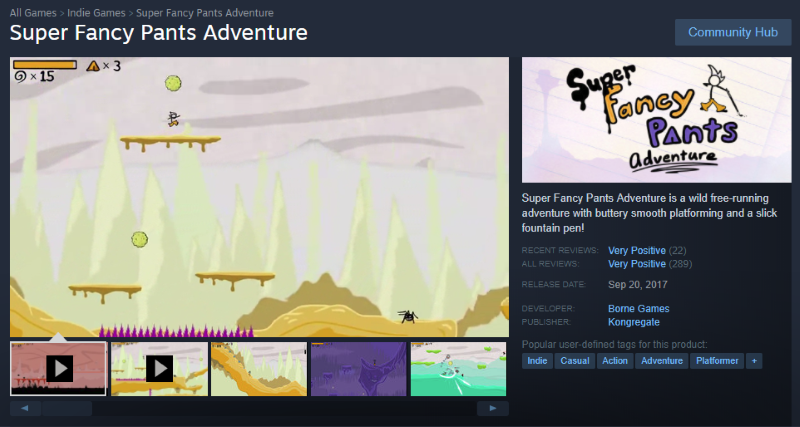 Super Fancy Pants Adventure is now available for iOS and Steam. We’ll still be working hard making sure that all gamers get the chance to play fantastic games and find their new favorite title. So if you’re idly browsing social media, not in the mood to stream a movie, or just want to burn a few minutes on your laptop, fire up Kongregate.com. These games won’t play themselves! Danilo is a Project Manager, helping out developers upload & promote their games on Kongregate.com. His hobbies include cheering on his hometown SF Giants & 49ers, and hosting trivia nights.